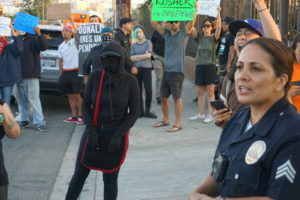 Nearly two dozen protesters showed up to Thursday’s “grand opening” of Asher Caffè and Lounge on Boyle Avenue near Whittier Boulevard, holding posters calling out the shop’s owner as an anti-immigrant, Trump supporter while marching and chanting outside the business. 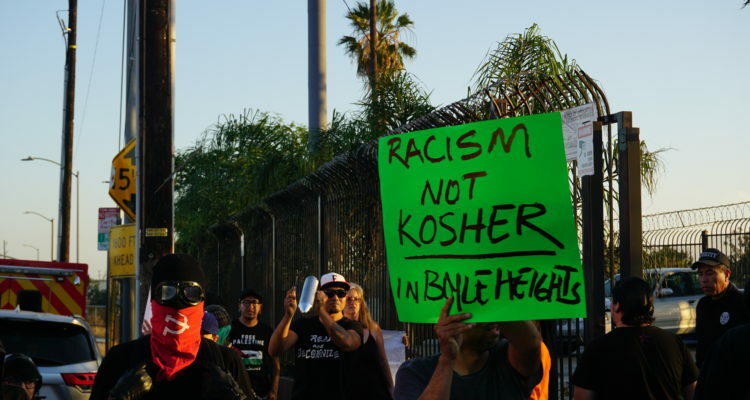 Protesters responded to a “hood alert” on Facebook and Instagram by Defend Boyle Heights, a coalition of community-based organizations against gentrification in Boyle Heights, about restaurant owner Asher Shalom. The alert included screenshots of various tweets from 2016 and 2017 that were retweeted by Shalom’s personal Twitter account. These retweets appear to express Shalom’s support for Trump and his immigration policies during his presidential campaign and after he took office. Shalom also owns Asher Fabric Concepts, a highly successful fabric and textile distributor that has had its showcase in Boyle Heights since 2015. 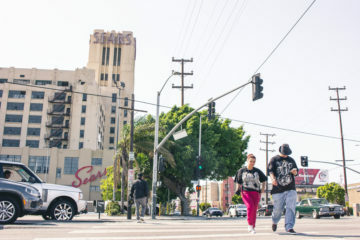 Boyle Heights Beat tried unsuccessfully to reach Shalom at the restaurant. Various calls from a reporter on Friday were placed on hold and never picked up. 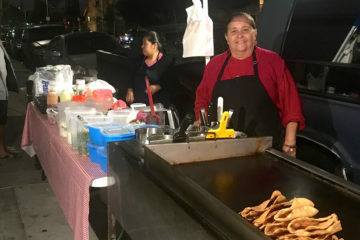 Nancy Meza, a volunteer organizer with Defend Boyle Heights, said she wanted community members to be informed of the business owner’s apparent political views. 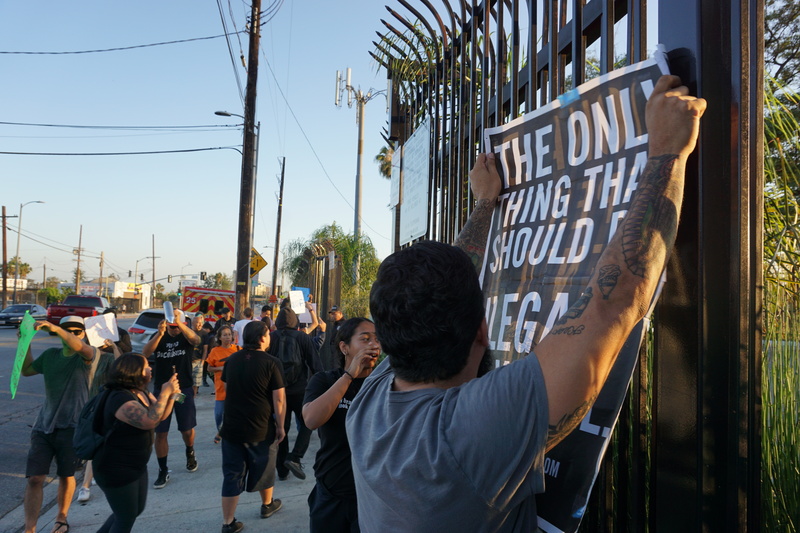 The protest began at 7:00 in the afternoon with around 10 protesters who created posters and signs outside of the restaurant. Some police officers and security guards were already stationed outside the business. More people came as the protest progressed. The group shouted at and surround cars entering the business’s parking lot. Police officers guarded the customers, making sure they would get in and out safely. 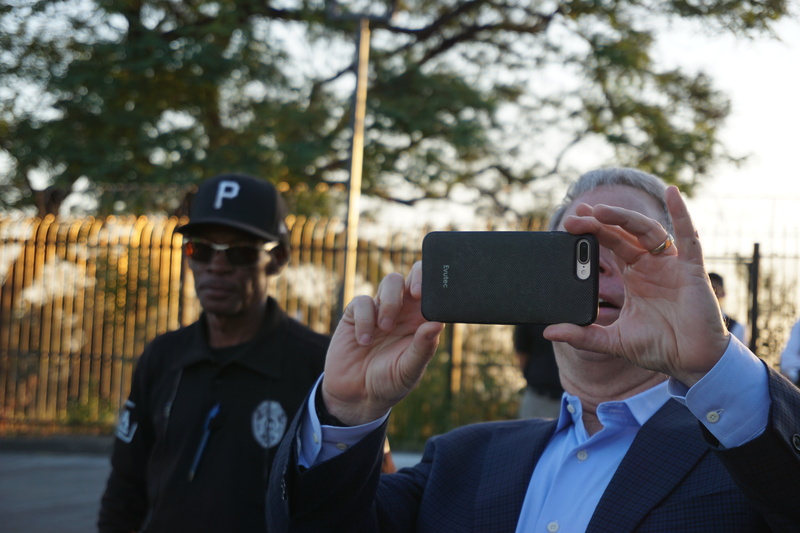 As the event progressed, more community members dropped by to show their support of the protest. Ending at around 9:00 in evening, the protest saw over 20 in attendance. A few days before the protest, the Boyle Heights Chamber of Commerce rescinded Shalom’s membership and returned his paid dues. Jennifer Lahoda, the Chamber’s president, said that action was taken because of a pair of anti-immigrant posts on Shalom’s Facebook page that chamber members were made aware of. “We rescinded his membership Tuesday because of public statements he made regarding immigrants that are not in line with the chamber’s values and objectives,” Lahoda said. It was not clear if David Shalom is related to the local business owner. 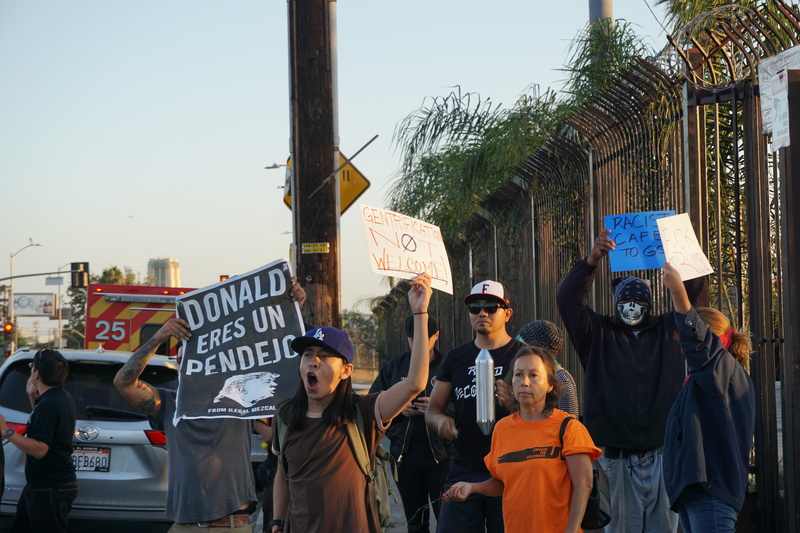 In 2017, Defend Boyle Heights also protested the opening of Weird Wave Coffee, calling it a “gentrifying business.” A year after the protest, the business is still open and has recently begun selling pizza alongside it’s original menu. All photos by Alex Medina. Alex Medina is a graduate of Francisco Bravo Medical Magnet High School. He is an avid runner and activist for the LGBTQA+ and Latinx communities. 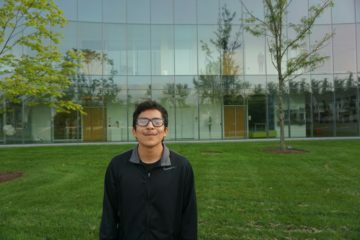 He is a student of Hamilton College in Central New York and plans to be an English and Political Science Major. You can find Alex on instagram @alexmedinagreen. Trump and his supporters are traitors: You mean defending their land? I’m positive that the people of Israel aren’t rounding up anyone different than them and throwing them into concentration camps and just flat out murdering them. Maybe do some research instead of regurgitating sound bites and articles you read on Facebook. is Israel’s treating Palestine any different than Egypt is? The violence isn’t initiated by Israel. Anyone know where this quote comes from? “NO HUMAN BEING IS ILLEGAL”? Illegal refers to their immigration status not their status as a human being. Looks like Shalom was trying to stir up some free publicity. Just like them dudes who opened up the café on Brooklyn Avenue (aka Cesar Chavez) There’s no such thing as bad publicity! Oy vey pinchie buey! Defend Boyle Heights is a bigoted, parasitic organization. They advocate discrimination and racism. Terrorists. The anti gentrification movement I admit has pros and cons, but the pros outweigh the cons. The only bad things I could think of is if you rent, your rent will probably go up and traffic. Good things? Increased employment opportunities, higher community involvement, homeowners can make more money off their houses, and diversity coming BACK into the neighborhood (100% Hispanic is not diversity). In any case, I do not see his business being successful given that the people in the area probably do not care about kosher food given the neighborhood today, and that probably gangs will tag up the place. Very sad that this is happening 🙁 Get a life people and let them live and make a living. Sad that no one can say what they feel and think (political or not) and yet you are ruining someones livelihood. Democrats have gone wild and crazy. People are people. Republicans never stoop that low. Shame on you all for doing this to a man who needs to support his family. Real shame. Why no reference to the threats of violence made against patrons…telling them the cops wouldn’t always be there to protect them? Why no reference to the crowd calling latinas coconuts and references to the cops as pigs? 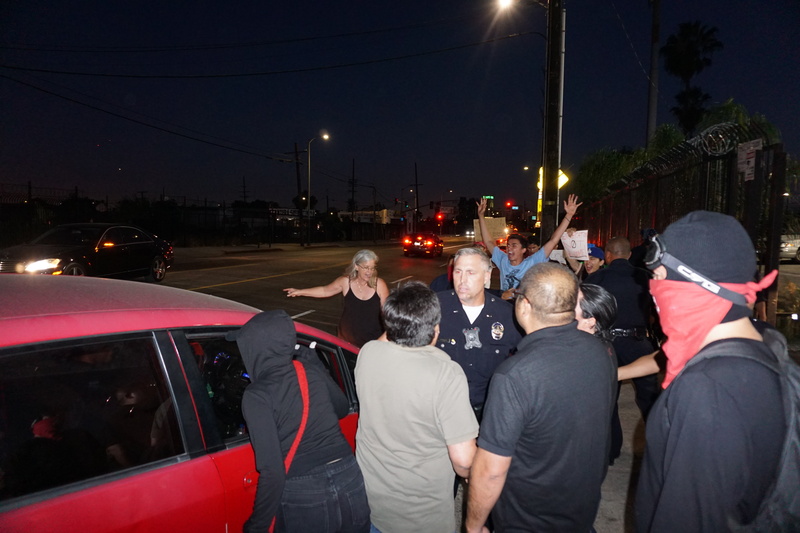 A security guard brandished a taser after a group of protestors followed him down the street.